I have a background in consultancy and recruitment, but I am not your standard career change coach! In my workshops, I combine group coaching and creative exercises with other tools for self-reflection to create a plan aligned with your values. Whether it is a job in a different industry or becoming an entrepreneur, you will learn how to stay motivated to make it all happen. Spend an evening getting your questions about career change answered! 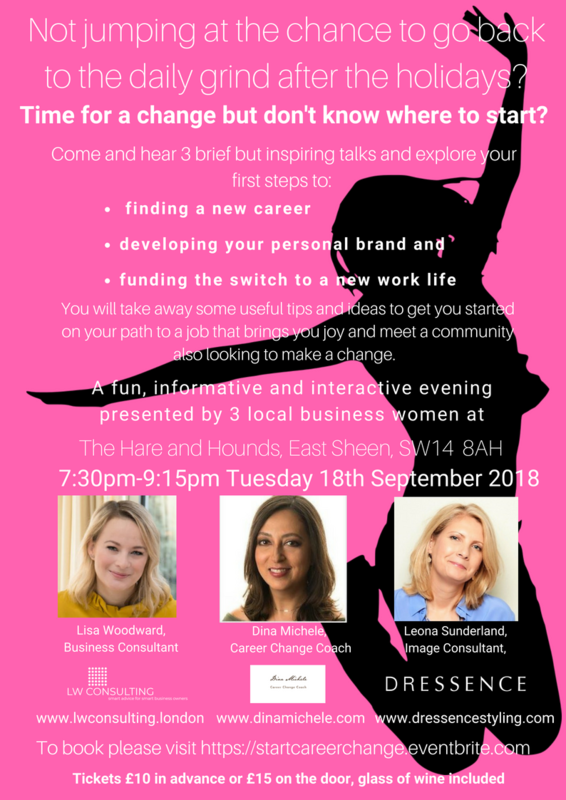 On Tuesday 18 September, come along to an interactive talk in SW London on how to create a new work life you can get excited about as well as identify what the first step could be for you! In this relaxed session, we will cover how to help you think about how you present yourself and gain the confidence to enter new environments. We will also talk about money matters to consider as you transition into a new career or business. We have put this evening together to address the first questions that come up for people when they start thinking about career change; we know how many people feel ‘stuck’ in their current position and are not sure what to do next. At this workshop, you’ll be hearing from career change coach Dina Michele, Leona Sunderland of Dressence personal styling and Lisa Woodward of LW Consulting. So, if you have been wondering what a new career could look like for you and what steps to take to make it happen, book your ticket now and let’s meet on the evening to get started!